In 2012, a Berlin-based artist described to Viktor Jakovleski a new world he had entered when he visited the city of Tultapec, north of Mexico City. 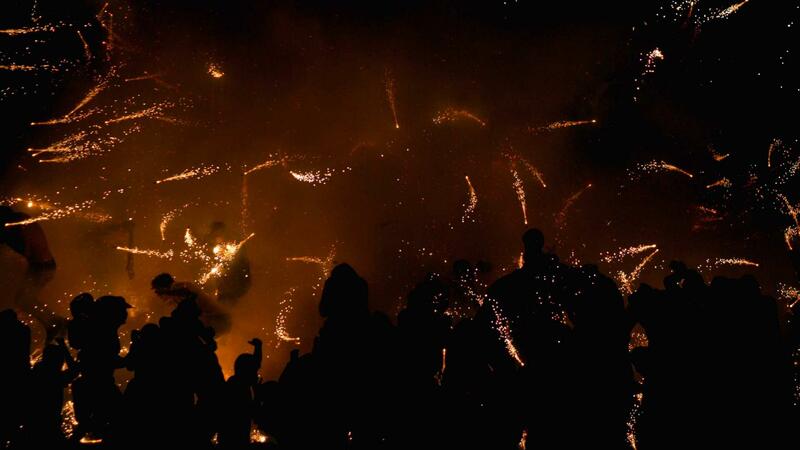 He described in great detail a fireworks festival that was a “super psychedelic experience”. Jakovleski, enraptured with the story, decided to a do a little research on his own about this celebration. Five years later, Jakovleski made the film, Brimstone and Glory, based off his visits to the festival. The subjects of the film, Jakovleski says took some detective work to find, are the heart of the film. A little boy, a firework maker and paper mache maker guide the viewer to see The National Pyrotenics show through these perspectives. Jakovleski says this interactive movie, made him fall in love with the traditions of Mexico and the city itself. Viktor Jakovleski, the director of the film Brimstone and Glory, spoke with Ana Perez about the story of how he found out about this celebration and the importance of telling his story now. Perez: How did you get the idea for the film? Jakovleski: I got the idea from a Berlin-based painter, an artist who, when we started talking and when I told him I was into film and filmmaking. He was like "Oh, my god. I have just been to this crazy place in Mexico where they make fireworks and make these big giant bulls and like they have a festival once a year. Fireworks festival where which is like a super psychedelic experience." I couldn't even follow what he was describing all these things to me that seemed out a picture book or something. I couldn't believe that this was real, what he was saying. So, he showed me some pictures that he took. He wanted to turn the pictures that he took into big oil paintings, which he did which looks fantastic. When I saw those pictures with all the sparks flying around I was completely stunned. I really couldn't believe what I was seeing. The beauty and the expressions of the people there. So at the end of our conversation he said, "Wow, some should really make a film about this." I was thinking to myself he is absolutely right. That night I didn't really sleep. I just did so much research on the place and I tried to find as much as possible. I found out that it is not really well known like it is a small place. It is north of Mexico City. The crucial moment, it was 2012, when my friend my collaborator Benh Zeitlin came to Berlin to present “Beasts of a Southern Wild”. I told him about the idea, "Dude, there is this place, where they make fireworks and they have this festival. Won't that make a great setting for a film?" and he is the biggest fireworks fan. He has fireworks in all of his movies and I knew that with this idea I could trigger something in him. At that time, I had the idea that he would produce the film and for him to direct and he totally jumped on the idea and that is like the perfect context for the film. We just started researching and I started more and more research and then at some point it was clear, that we would switch roles. He would produce and I would direct. I was just so on fire about this one. It started with a spark, you know? of being excited to go this place and seeing what would happen and the more often I went the more we. The whole experience to get there was a process. At first, I wasn't sure if I could make the film as I said before I had never been to Mexico before but when I was still in Berlin and I was reading, some of Octavio Paz's writing I more and more started to learn more about the mentality, this Mexican mentality and what the celebration means, what fireworks mean to them, so that was a big chunk of my research. Perez: Why tell this story now? Jakovleski: The story we wanted to tell is to create the experience of what it feels like to be there. So we, our idea, was to really trying to make the audience feel like they had been to the place and try to make them feel like they are standing next to people that are mixing gunpowder and to feel that danger of maybe something just exploding in the next moment. You know, it is not the classic, um, way of telling a story. We are really trying to go for all the senses as for what it sounds like, what it looks like, what it feels like. We were just all mind blown by the place and the idea the place, the firework making and the festival idea. We are just happy to offer, maybe a slightly different image of what Mexico is. I feel like in the media, most of the time, when we hear or read about Mexico, it is about the drug thing and the cartels. With this film, I think we are just offering a different perspective, we are focusing on something very different that we don’t see normally.